Intel® Xeon® processor E5-2600 v2 product family-based solutions running workloads such as data deduplication and compression can help you reduce your storage capacity needs by up to 70 percent. By boosting your general computing performance by up to 3.4 times over a typical four-year old server, the Intel Xeon processor E5-2600 v2 product family will give ...you the performance you need to enable compression, deduplication, thin provisioning, and automatic tiering of data which are essential for optimizing storage capacity and streamlining data center efficiency. • Increase I/O bandwidth up to 2X to help eliminate network bottlenecks. • Boost I/O performance and further reduce latency and power. 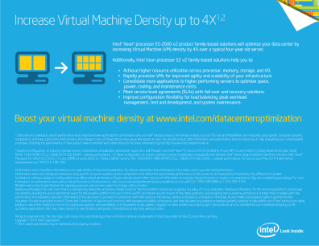 Read the full Increase Virtual Machine Density Datagraphic.